If you follow my other blog, Jo’s Journal, you may remember that we took a trip to the Isle of Skye back in April this year. One of the places we visited was Dunvegan Castle, which sits on the western shore of the Waternish peninsula, tucked into a small inlet of Loch Dunvegan. This is the ancestral home of Clan MacLeod, and it has remained in the ownership of this family for nearly 750 years, from 1270 right up to the present day. The name ‘MacLeod’ is believed to stem from Leod, a son of Olaf the Black, who lived in the 13th century and was descended from the Norse King Harald Hardrada. Leod’s two sons, Tormod and Torquil, are the common ancestors of the MacLeods of Dunvegan, Harris and Glenelg, and the MacLeods of Lewis. Dunvegan is neither fairytale-pretty, like Inveraray, nor gloriously derelict, like Kilchurn; the facade that it presents to the public is, I have to say, rather stony and forbidding – but after all, it should be remembered that this is precisely the impression that medieval castle-builders set out to create. Potential invaders would have been stopped in their tracks, and even the kinsmen of the MacLeods would have been awestruck. 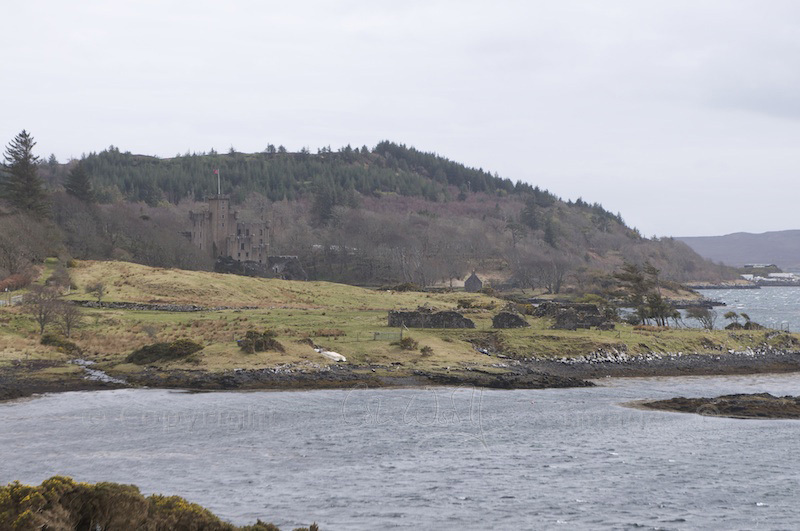 In fact, when we approach Dunvegan Castle from the landward side we are looking at the rear of the property, because, like many Scottish castles, Dunvegan faces out to sea. The landward side had no entrance at all until the mid-1700s; before that, security in the face of an attack mattered a lot more than convenience of access. The building stands on a 30-foot-high ‘plug’ of basalt which, in the 13th century, would have been surrounded by water. Arriving by boat, visitors would have been taken to the bottom of a flight of steps that have been cut into the steep rock, leading up to a sea gate. They were then allowed to enter the castle one by one, via a series of narrow passages, and under the watchful eye of guards. Since that time the waters of the loch have gradually receded, and silt deposits have re-drawn the map very slightly, meaning that the castle has lost its natural moat. This also means that it’s quite hard to get a photo of the castle in its full splendour, unless you scramble around the shore at low tide or take a boat out onto the loch. Our visit was on a dull day with a bitingly cold wind that was blowing bullets of rain in from the Minch, and we weren’t inclined to linger in the gardens or on the bridge over the burn, where a fine view up the loch could be glimpsed between the trees. We hurried up the steps and into the entrance hall – and into another era. The interior was shadowy, with lots of oak furniture, muted wallpaper and dark red carpets; I had a fleeting sense of having arrived in someone’s home unannounced, but a smiling receptionist appeared at that instant and made us all very welcome. 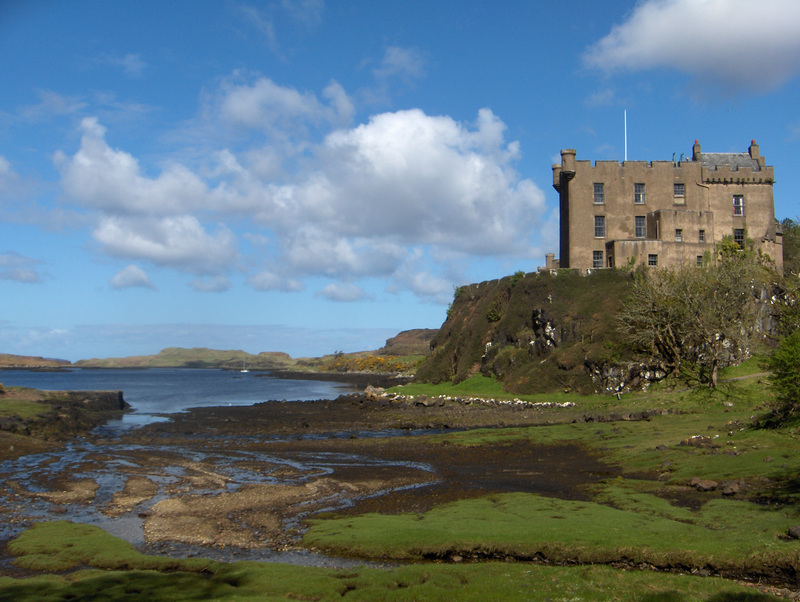 Dunvegan Castle is still a home, one that is occupied and enjoyed by the MacLeod family. While most of the apartments are open to the public, some rooms on the top floor are kept private. We were warned that photography within the castle was not allowed, which I found slightly disappointing but at the same time I completely understood. It would have been quite easy to disregard this request, because on most occasions we were alone in a room – but we didn’t. This is why I don’t have many photos to show you! Instead, I’m afraid you’ll have to rely on my descriptions, and on the stories behind the fascinating artefacts and exhibits within these massive walls. There was something about Dunvegan Castle that made me tread very softly around its rooms and corridors. Possibly the abundance of large-scale oil portraits made me feel that the lairds (and their ladies) of former centuries were regarding me with varied degrees of indulgence; but there is an air of stillness – not quite comfort, but then I am not a MacLeod – as well as a sense of security and a feeling that the place is well loved. The sound of burns cascading down the hillside is said to have lulled many of its guests to sleep. A mounted bull’s head, and below it the MacLeod motto, ‘Hold Fast’; a framed letter from the writer and traveller Samuel Johnson, who stayed here in 1773 with his companion James Boswell; and a letter from the novelist Sir Walter Scott, thanking his hostess for her hospitality; all these had to be examined with awe and interest. A large collection of antique swords is displayed in glass cases, below the Colours of the 2nd Battalion of the Black Watch. This is a house that has offered the warmest hospitality to its friends and unreserved hostility to its enemies, ever since its foundations were laid. The pride is deep within its walls and rooted into the rock below. We climbed the stairs to the Dining Room, where the elegant and highly polished table supported several branches of silver candelabra. Big heavy curtains framed the windows, and the dusky red colour scheme added a feeling of warmth. According to the guide book, the huge oak sideboard was brought to the castle in 1613 by Sir Rory Mor, the 15th Chief, who had visited the Court of James I in London and wanted to introduce its refined style of dining to his island fortress. But once again, it was the portraits that caught my eye – or was I catching theirs? 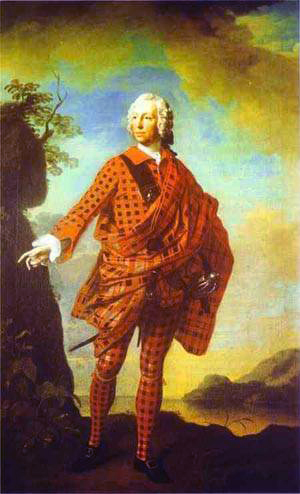 Norman MacLeod, the 22nd Chief, clad from head to toe in red tartan, striking a pose at the foot of the Castle’s rock; his son John, resplendent in the elegant fashion of the 1700s, a silver coat thrown over a light blue silk waistcoat with gold frogging, lace ruffles falling over his hands; the 18th Chief, Ian Breac, who was born in 1637 and looked a good humoured, no-nonsense type in a bouffant wig and a jacket of rich orange velvet, unbuttoned to reveal the breastplate of a suit of armour; and Sarah, the second wife of Norman MacLeod, the 23rd Chief, a beautiful woman by the standards of any era, her long dark brown hair resting on her shoulder, her gorgeous peach-coloured silk gown cut low at the front with lace draped negligently around the neckline, and high-heeled embroidered shoes on her feet. In this life-size, full-length portrait by Zoffany she is shown holding the hand of a beautiful toddler with strawberry-blonde hair. I almost felt that I could walk up to her and start a conversation. After the Library, where we could look at, but not touch, the many rare and precious volumes, we passed into the Drawing Room. Housed in the castle’s keep and dating from around 1360, this room was originally the Great Hall before it was converted in the 18th century to a salon of the first style and elegance. I am ashamed to say I don’t remember much about the Drawing Room, except for one item – the Fairy Flag. The Fairy Flag of Dunvegan has so many legends woven into its fraying, ancient fabric that I need another feature just to tell you about them. It is framed securely in a glass case, and is such a prized possession of the MacLeods that an aura of superstition surrounds it even now. It is said that any army who carries this flag into battle is invincible. I almost had to be dragged away. I’ll tell you more about it soon, I promise! I spent so much time gazing at the Fairy Flag that Colin, Leonie and Andrew deserted me and moved on. This meant that I was on my own when I stepped from the opulence of the Drawing Room into a short, dark corridor that led to the pit dungeon. Also known as an oubliette, which very roughly translates as “Just throw him in there and leave him to starve”, this is a small cavern gouged out of the rock, 13 feet deep, with an iron grille above. What a contrast to the refinements of the room above, and how doubly barbaric: this cell was deliberately sited to be close to the kitchen stairwell, so that the prisoners could smell the food. And talking of mannequins… which are another of my pet hates… I followed the steps down to the castle’s original kitchen, where I was tempted into a windowless room by the sight of some Pictish-looking carved stones ranged around the walls. Next to another dark recess was a sign pointing to a servants’ staircase, and I popped my head round to look. On the staircase, lit by an eerie glow, was a maid in a mob cap and apron, carrying a tray of food. This, to put it mildly, scared the living daylights out of me. I can’t remember what I said. I walked smartly out of that place, trying not to run. But just how many unique artefacts lie within the protective cloak of this amazing castle, preserved for posterity in glass cabinets, free from the ravages of time and the intrusion of flashguns? In the North Room is the Great Sword of Dunvegan, a claidheamh mor (pronounced ‘claymore’) that belonged to the aptly-named William Long Sword, the 7th Chief, who was killed in 1480: looking at this weapon, you suddenly realise the formidable strength of a Highlander at that time, and the courage and stamina that would have been required to wield it. The MacCrimmon Pipes are an ancient set of bagpipes belonging to the MacCrimmon clan, hereditary pipers to the MacLeod Chief for thirteen generations; their gift, so the story goes, was bestowed on a young MacCrimmon piper by a fairy. 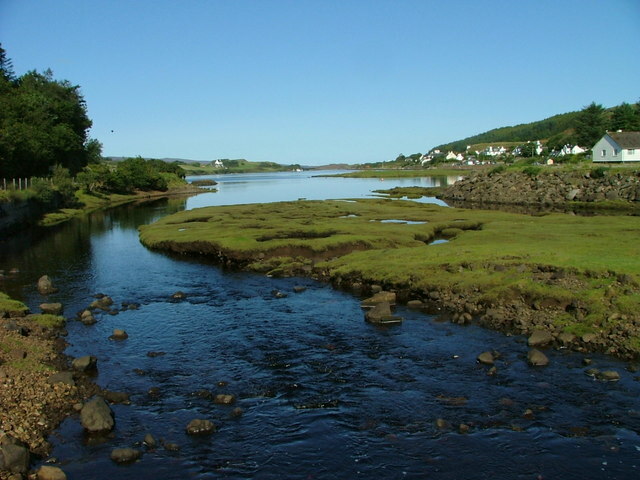 Dunvegan is still a centre for excellence in piping, and recitals are held here every year. And would you like a to see a lock of Bonnie Prince Charlie’s hair, or a garment worn by Flora MacDonald who bravely travelled with him “over the sea to Skye”? The spectacles worn by the Prince’s boatman, Donald MacLeod of Galtrigal*, or the ‘Amen Glass’ (now sadly broken) given to Donald by the Prince, in token of his thanks? They are all here, obviously cherished beyond words by the MacLeod family, in this small room with its soaring vantage point over the loch and its islands. Just 20 miles away, across the Minch, is the island of Benbecula, from where Flora and her royal companion set sail. *The MacLeod Chief at the time of the 1745 Uprising was not a Jacobite sympathiser, but many of his clansmen were. Then there’s the Dunvegan Cup, curiously square in shape, intricately adorned with silver and resting on four tiny human-shaped ‘feet’. This was presented to Sir Rory Mor by the O’Neills of Ulster, for lending his support to their battles against Elizabeth I of England. A Latin inscription around the rim reads: “Katherine, daughter of King Neill, wife of MacGuire Prince of Fermanagh had me made in the year of God 1493”. 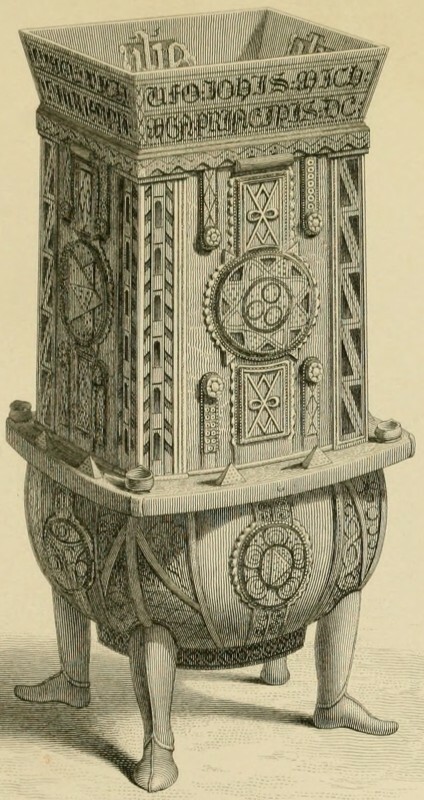 The vessel itself is made of wood that has been identified as bog oak or alder and dated to around 900 AD, leading to speculation that it started life as a precious relic in a place of worship. Of all the wonderful items in the castle (apart from the Fairy Flag!) I loved this one the best. Rory Mor also gave his name to a great horn, originally a bull’s horn, rimmed with silver and capable of holding one and three-quarter bottles of wine. Traditionally, the MacLeod Chief was expected to be able to down the contents of the horn in one draught, thereby proving his ability to drink his enemies under the table. Yes, the custom is still upheld today, and the 29th Chief, John MacLeod, is known to have succeeded! When one writer in 1549 described Dunvegan Castle as “Ane starke strengthe biggit upon ane craig”, he wasn’t joking. He could just as well have been referring to the MacLeods themselves. This was pretty much the end of our tour, which was just as well because I felt as if I couldn’t absorb any more. I have seen many castles and ancient sites, but none of them compare with Dunvegan, purely because of its history and its jealously-guarded possessions. I’m glad I bought a guide book, because at least I can refer to it and refresh my memory. 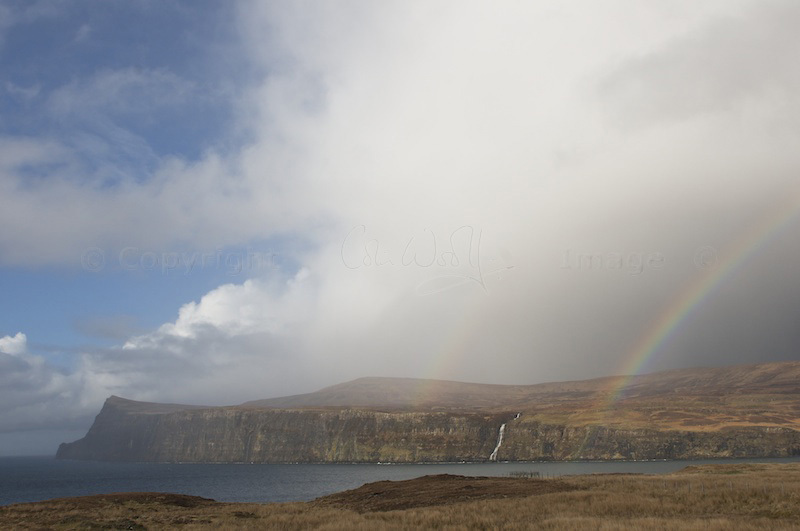 There’s so much more to tell you – click here to read my feature about Dunvegan’s Fairy Flag! 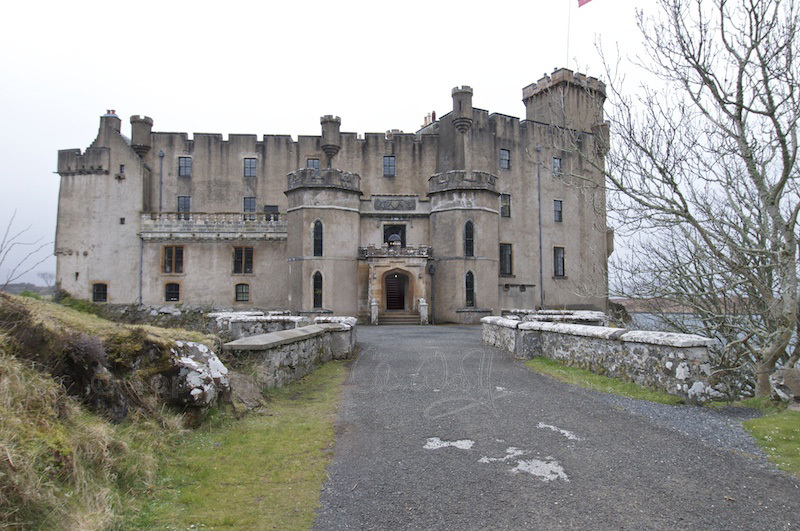 If you’re interested in finding out more about Dunvegan Castle and the MacLeod clan, take a look at their excellent website, www.dunvegancastle.com. 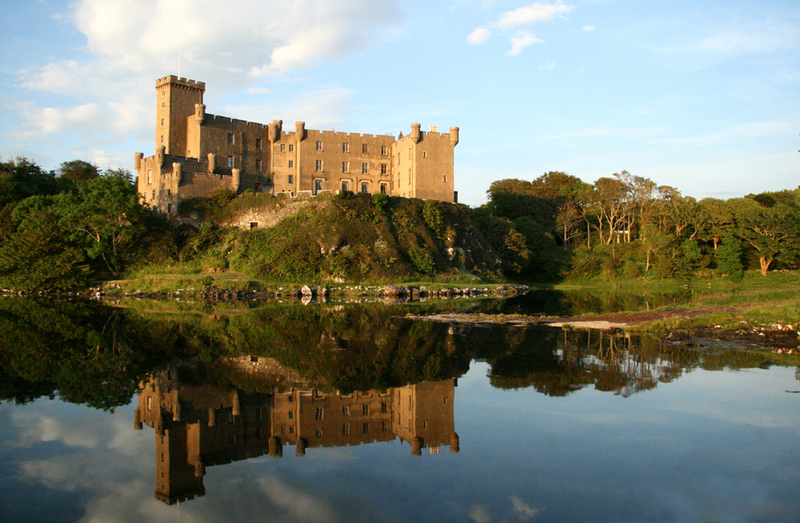 Dunvegan Castle is open daily (10 am to 5.30 pm) between 29th March and 15th October; throughout the autumn and winter it is open for groups on weekdays, by appointment. Admission is charged (see their website for more details) and you can also take a boat trip out onto the loch, to look for seals and to view the castle from its most flattering perspective. All photos copyright © Colin & Jo Woolf unless otherwise stated. It was too perishingly cold to go round the gardens, which was a shame! The flowers were all behind, because it was such a cold spring. Glad it brought back some nice memories. I’ve only seen Dunvegan Castle from the outside but one day I must go back and go round the inside. After reading your wonderful descriptions I’m intrigued to see all these curious objects for myself. The portraits sound particularly spendid, as does that most unusual cup. I’m looking forward to the Fairy Flag. We have driven past it too, on more than one occasion, but I’m glad to we got to see the inside of it this time. I had read about the Fairy Flag beforehand so I was keen to see it. I must admit that this exhibit didn’t provoke quite the same amount of awe in everyone who was with me, though I did my best! Glad that you enjoyed it – thank you! A gorgeous post full of intriguing descriptions! 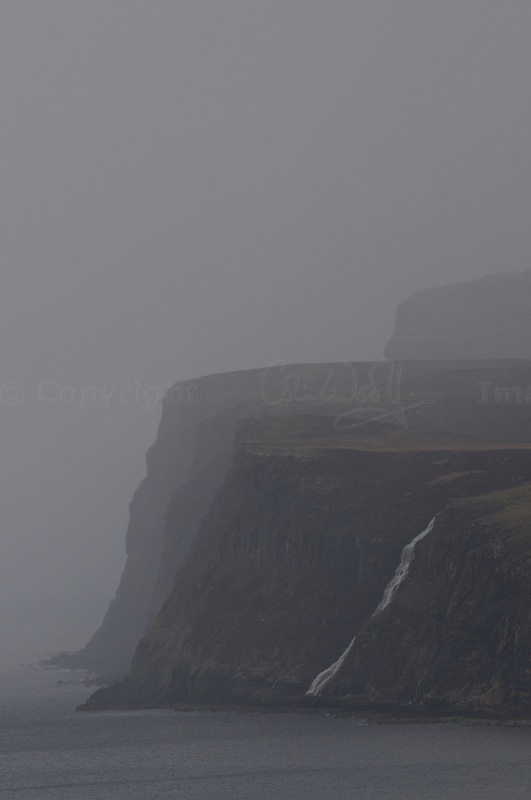 I have been to Skye a few times but never had the time to visit Dunvegan. Now I must go, to see all the treasures you’ve described so aptly. Those manikins frighten the life out of me as well! Thank you very much! I am sure you would love Dunvegan Castle as much as I did, and I hope you manage to get there soon. At least you’re warned about the manikins! This was a fabulous tour Jo…and your descriptions are wonderful. You must have taken some lengthly notes! Thanks! 🙂 I am lucky because the guide book contains some photos – they are not available online and so I can’t reproduce them! Mannequins didn’t enhance my experience at all. Apparitions I (might) be able to cope with! I like all the photos but the last one has something special for me. When I first saw it, I thought it’s something wrong with, but after one second I realized the beauty of the back mountains and how rain is like a filter. Very nice. Thank you, Cornel! That’s one of Colin’s favourites, too.